From top left: Carroll Rosenwald School; Hannah Rosenwald School; Hope Rosenwald School; Clarendon County Rosenwald School insurance photograph; Great Branch Teacherage; Gifford Rosenwald School state historical marker. In 1915, Sears and Roebuck President, Julius Rosenwald, established a matching grant fund in his name to construct better quality black schools throughout the South. Between 1917 and 1932, his Fund assisted in the construction of over 5,000 school buildings, forever changing the rural Southern landscape. Nearly 500 buildings were constructed in South Carolina. 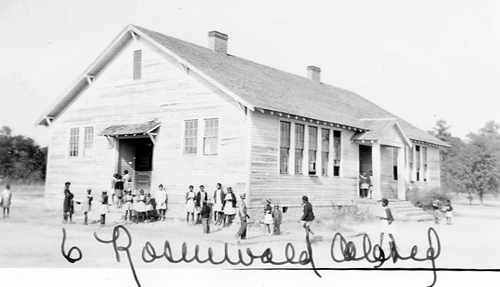 At a time when State support for educating African American children was woefully inadequate, Rosenwald Schools played a critical role in educating South Carolina’s children. Though over one-third of black children in the South in the first half of the twentieth century passed through the doors of a Rosenwald school, today, many of these schools of hope have disappeared from the landscape. In South Carolina, many became victims of neglect and abandonment as a result of the School Equalization Program (or 3% sales tax program), started in 1951 under Governor James Byrnes, which consolidated rural black schools by building state-of-the-art new black schools in an effort to thwart integration. Other Rosenwald schools have been severely altered and still others stand empty awaiting a new life. SC Rosenwald Schools Database: Database providing a synthesis of information from a number of sources including the Rosenwald Fund Papers housed at the Fisk University Archives; The South Carolina Statewide Survey of Historic Properties cards; personal interviews; and other local and state documentary sources. Rosenwald Schools on SCHPR: Rosenwald Schools listed in the National Register of Historic Places and/or recorded in historic resources surveys. Documentation of these properties is available online through the South Carolina Historic Properties Record (SCHPR). The Rosenwald School Building Program in South Carolina, 1917-1932 (PDF): National Register Multiple Property Documentation Form providing historic context for the history of Rosenwald Schools in South Carolina. Rosenwald Schools Initiative: Describes the Rosenwald Schools Initiative sponsored by the National Trust for Historic Preservation. The site includes historical information about Rosenwald Schools and links to many other sources. Rosenwald Schools: Beacons for Black Education in the American South: Created by Dr. Tom Hanchett, Director of the Museum of the New South in Charlotte, NC, the site focuses on North Carolina but also contains a history of the Rosenwald Fund, all of the floor plans used by the Fund from 1917-1932, and links. Fisk University Rosenwald Fund Card File Database: The most comprehensive online searchable database for known Rosenwald Schools built in 15 southern states. It is composed of the information found on the original Rosenwald Fund cards housed at Fisk University. The Jackson Davis Collection of African American Educational Photographs: A digitized database of nearly 6,000 photographs of African American schools, teachers, and students taken throughout the Southeastern United States by Jackson Davis in the first half of the 20th century. The complete collection, which also includes documents, is housed at the Albert and Shirley Small Special Collections Library on the University of Virginia campus. Budget and Control Board. Sinking Fund Commission. Insurance File Photographs: This is an online collection, housed on the SC Department of Archives and History's Online Records Index, of photographs of SC schools made between 1935 and 1952. The photographs document both black and white schools. To access the photos, under "Series” type and select “Insurance File Photographs (S112113)”.